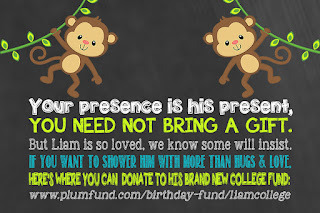 Well, as quickly as it came, Liam's birthday also went on December 18. I feel a little bad, since his actual birthday was not much to write about. The night before his birthday, we went to the Lincoln Park Zoo Lights to see the Christmas lights and Santa, so that was a fun excursion. On his actual birthday, we left to go home to Iowa for the holidays that afternoon, so he spent much of his birthday in the car. :( But, we woke him up with big smiles, lots of kisses, and he opened a couple of presents from me and Bryan. We arrived home in the early evening, Liam had a little dinner, and then it was time for bed! BUT, the next day, we made it up to him with a birthday party! Ah, the first birthday party. I went back and forth about this. 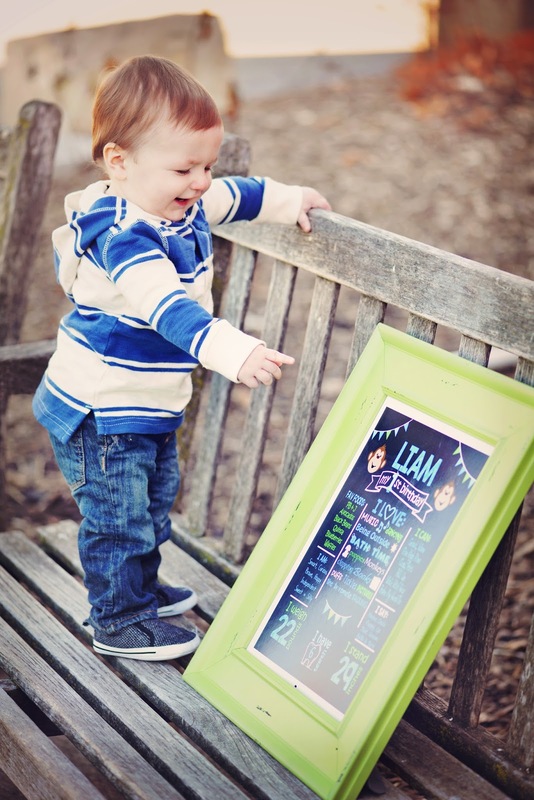 I know many moms out there go completely overboard, making the first birthday party the most incredible, Pinterest-worthy shindig ever, creating all the decorations themselves in an effort to make this the best party the kid will ever have. I have no problem with that, and to those parents, I say good on ya! 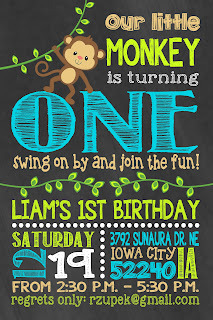 But for us, we decided to keep Liam's birthday party relatively tame, knowing that he will not remember it. We want to save the over-the-top, DIY, themed parties for later years when Liam can remember them and appreciate them. Personal choice. A little unsure at first, but he got the hang of it! So, we kept it simple. The guest list was our family and close friends in the area (which still totaled about 40 people). Being that his birthday is one week before Christmas, not everyone could make it, and that was totally fine. 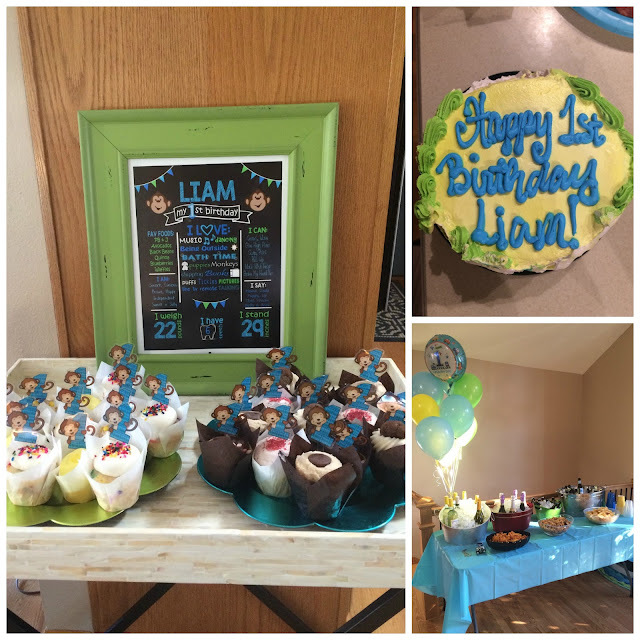 We ordered pizza, had beer and wine for the adults, provided cupcakes for the guests and a smash cake for Liam, and called it a day! 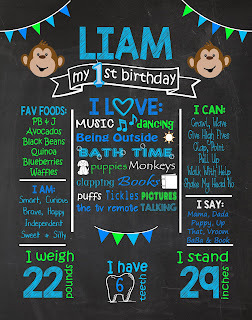 I did have a theme, which was courtesy of Etsy and Hobby Lobby, and kept with Liam's favorite animal: MONKEY! I was able to find a few cute decorations from Hobby Lobby, got some balloons from the grocery store, and that was that for decorations. I had the invites done from Etsy and they turned out super cute. We opted to ask people for no birthday gifts, mainly because the chid needs nothing, but also because we knew he would get a haul for Christmas and we only have so much room in the car! 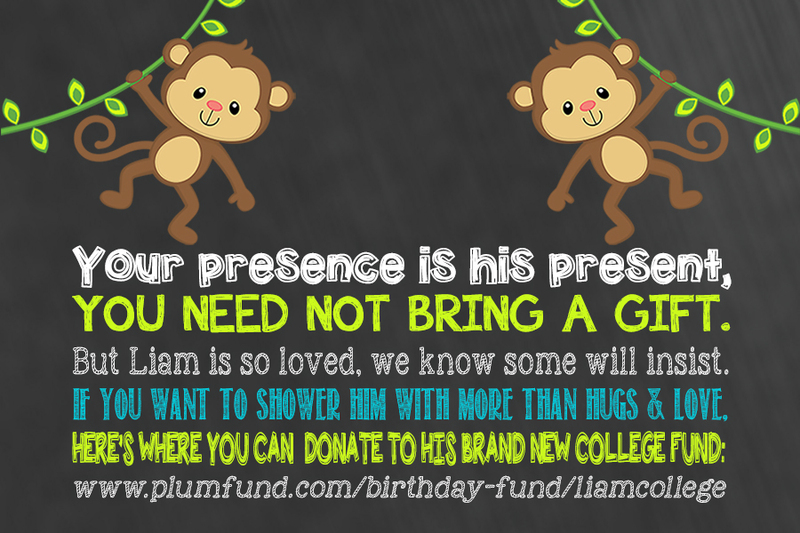 Knowing that people would want to do something, we offered them a way to donate to Liam's college fund. I was so happy that most everyone followed our wishes! He did get a couple toys, so it was the perfect balance. 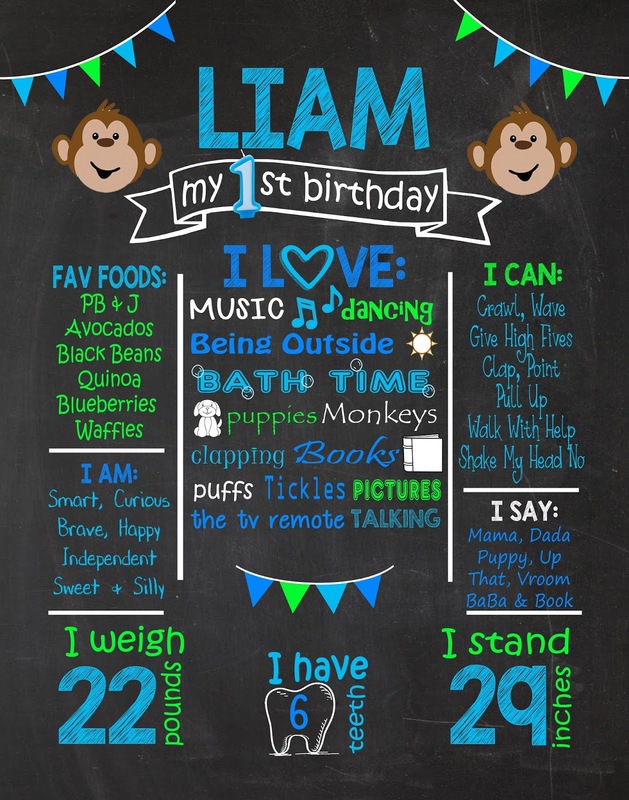 I did also have this chalkboard piece made to display at the party, and Liam took some photos with it a few weeks prior to his birthday. I love the way it turned out! He had a great time and that's the most important part. 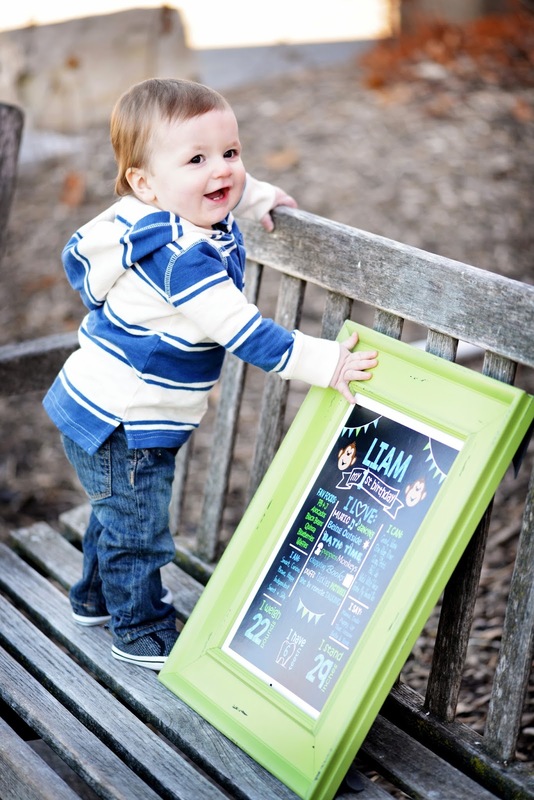 It was wonderful to be surrounded by our family and friends as they loved on Liam, and also celebrated US - because hey, we did it! 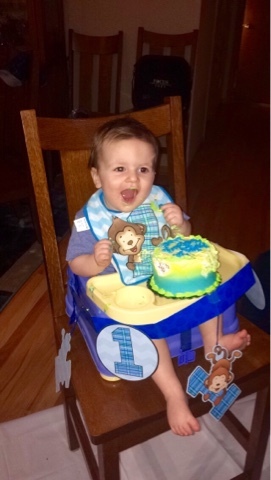 Enjoy this photo of Liam eating his cake...it's too cute! 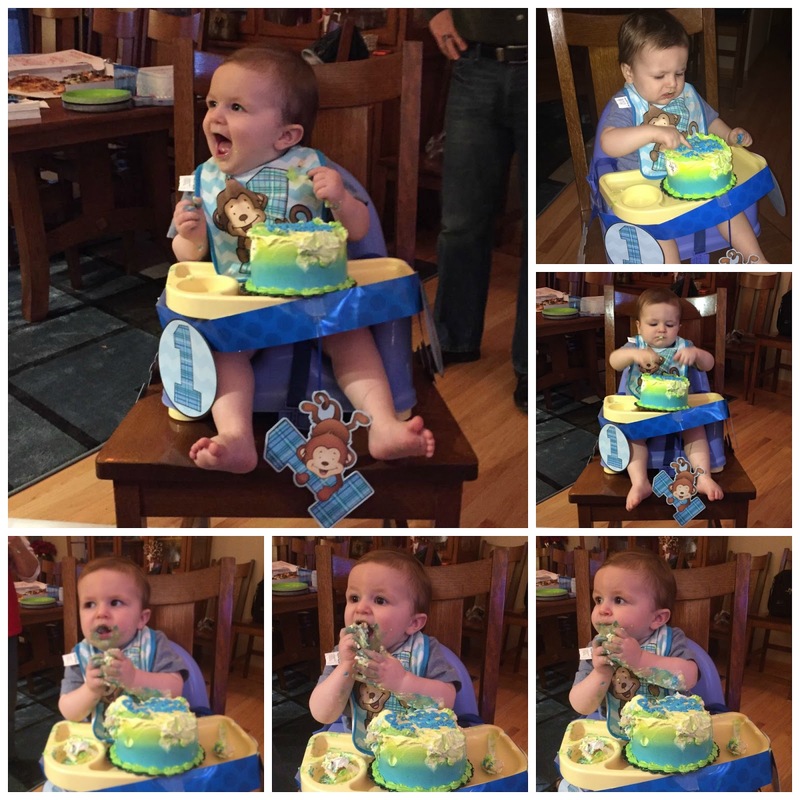 Liam look so adorable in these pictures, and he certainly seems to be enjoying his birthday and the cake. 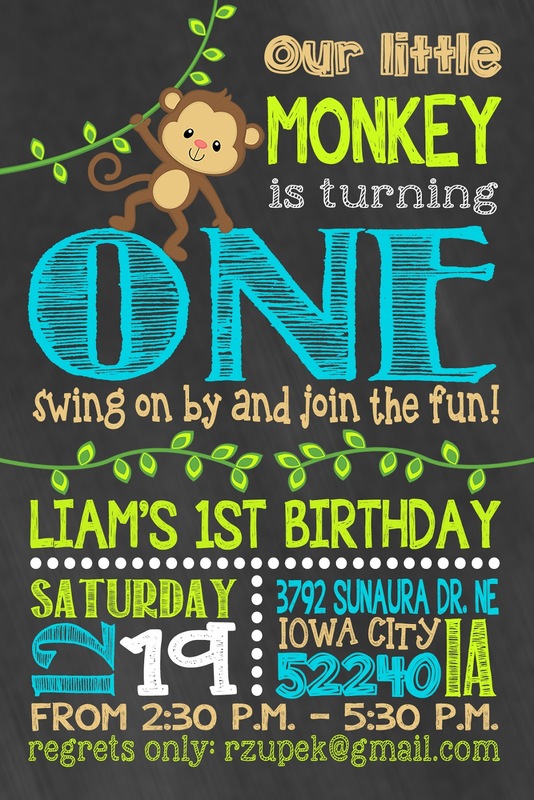 I liked the cool birthday invitations as well. My daughter will also be celebrating her birthday this week, and I’m organizing a wonderful party for the occasion at the amazing venue NYC. 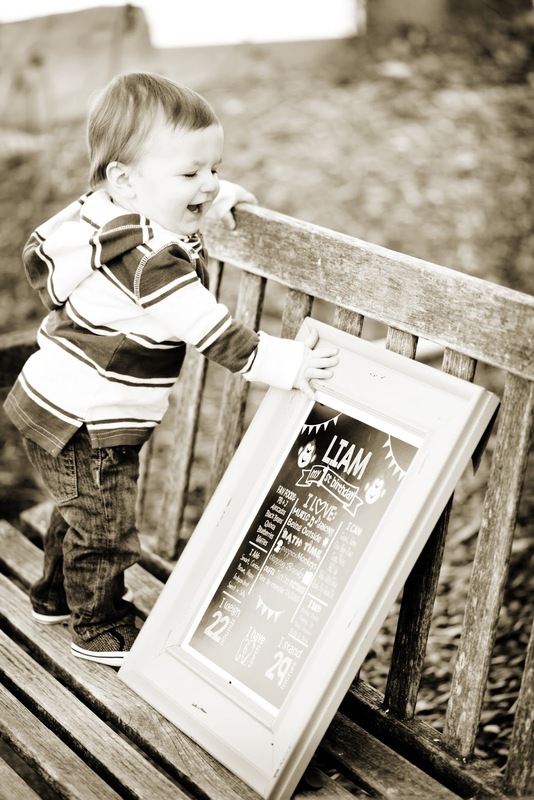 10 Things I Was Before I Was "Mom"